I have had requests to share my quick way to change line (or ink) colors in Photoshop Elements or Photoshop (I am not sure if GIMP has the same controls but it might). 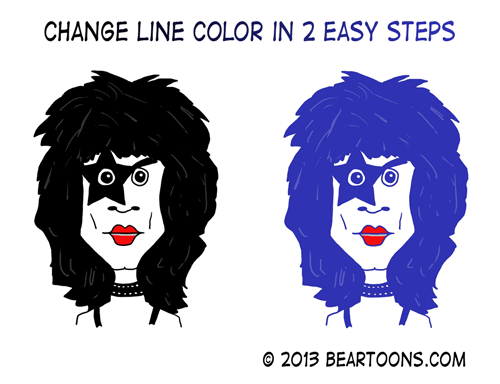 Now I know there is no reason you would want to make Paul Stanley of KISS fame into the blue colored thing on the right above but I needed a good image with a lot of dark areas to really show you the impact of what you can do so Paul came to mind. STEP ONE: Choose the layer that you want to change the color and in the Layers Palette (typically to the right of the screen) click on the square checkerboard image next to the word “Lock”. Don’t click on the actual lock image as that will actually lock your layer completely allowing now changes to be made. By clicking on the checkerboard pattern you are locking the transparent areas of your layer allowing you to easily change the nontransparent portion to whatever color you want. STEP TWO: Choose the foreground color that you want to change the image to (in my example I chose blue) and go to EDIT>FILL SELECTION and hit OK. That’s it. If you only want to change a portion of the layer, you can use your brush tool and paint over any area you wish. 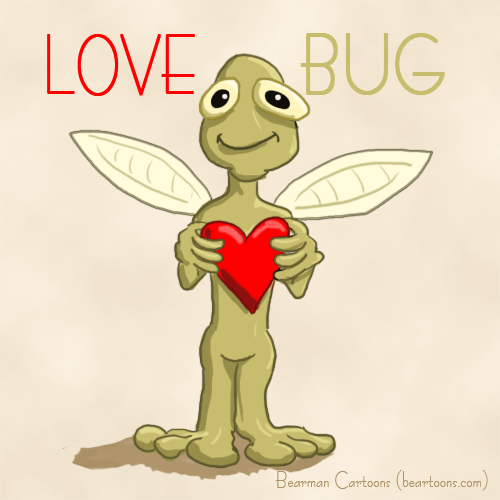 That is what I did in my love bug image from a month ago. Everything started as black ink lines and then I used the process described above to change the outline of the bug to a darker green and the heart to a darker red while still keeping the smile and the eyeballs the original black. Let me know if anything isn’t clear. Have fun. Cool tip, Bearman! I’m going to add this technique to my painting repertoire. I don’t have this program and wouldn’t know what to do with it if I did. I’m just not this talented. Thanks for sharing this great tip, Bearman! It’s an easy way to make our art look better. Who is Art and does he look so bad now? Next time: Bearman teaches you how to make everyone’s hair green! Thanks for sharing your tips Bearman, always a learning experience! OK I just tested the GIMP method & it worked. Very similar to your photoshop way of doing it. That is cool. Thanks for sharing Tony. Now you can feel special like the rest of us. That’s a good tip, well explained. Photoshop has so many features you could keep learning new stuff for years. In all the PS books I have none had that gem. Someone needs to write a book just for advanced features. I apply a curves adjustment layer to an art layer I want to ‘color’ (with a clipping mask – control+alt+G on PC – then the adjustment layer affects only the layer directly below it). I use that curves layer to lighten the blacks in the art layer to a middle gray (you can either merge those two layers or keep them separate). Then I apply a hue/saturation adjustment layer (and apply it to the levels / art layer only), and check the ‘colorize’ box. What’s nice about that is – if I’m indecisive about color(s) – I can move the hue / saturation / darkness sliders and ‘see’ changes as they happen. Plus, if I change my mind about colors, I can very easily go back and adjust the slider(s) again. Also, you probably knew about that technique already, so… you know… my apologies for rambling. Like I always do. Oh yeah, I probably should have mentioned this is for Photoshop. haha…it is good you made the reference cuz I wouldn’t have known who sang that. Thanks, B! I’ve always wondered how to pull that off. You know I follow all of your tutorials and tips and run them into the ground, right? 🙂 And I wanted to say thank you for hipping me to a new place to get fonts. I don’t know if you’d noticed I’d been using a lot of new ones lately.